The Eden Drive-In was recently listed as one of the 'Most Charming Drive-In Theatres Left In America' by the Architectural Digest. The Triad gem was recently listed as one of the ‘Most Charming Drive-In Theaters Left In America’ by the Architectural Digest. WFMY News 2’s Digital Reporter Laura Brache took on Old Highway 770 and met with long-time co-owner Tim Robertson. According to Robertson, some distant relatives owned the property when the drive-in was run by Consolidated Theaters. 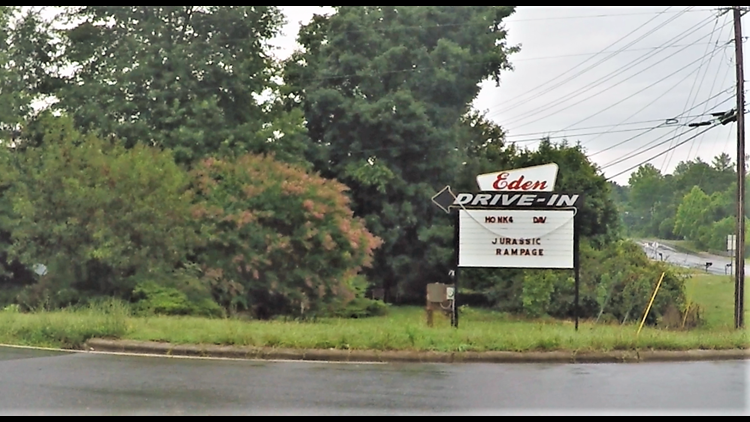 The Eden Drive-In originally opened in 1949 and featured its films in film, but have now converted into completely digital picture projection and sound through FM stereo. So, what exactly is the difference between going to an indoor movie theater and a drive-in, you may ask? And that’s exactly what guests do. Pull up their van, unload the picnic basket or cooler, and sit in the back of their vehicles, like the Dix family, from Danville, Va.
"A lot of folks I know go here," said Caroline Dix, a mother of four girls. "We try to come as much as possible, especially when they have good movies," said Wayne Dix, her husband. Don't let the old-school vibe fool you, because all the movies shown are new releases like The Incredibles 2, Jurassic World, Rampage, and more. “We’re just trying to run a good business and something for everybody here to have fun with and something that everybody here in Rockingham County can be proud of,” Robertson, also the owner of a drive-in theater in Albemarle, NC, said. This isn't the first time the Eden Drive-in is featured in a list. "We don’t try to make any of these lists, we’re just trying to run a good business and something for everybody here to have fun with and something that everybody here in Rockingham County can be proud of," Robertson mentioned. The Architectural Digest says there are about 350 drive-in theaters operating in the U.S. The Drive-In is open Friday through Sunday from 6:30PM until the end of the films which begin at sundown. Ticket prices are $7 per adult and $5 per child ages 6-11 and free for children under 6.